I love holiday specials. A Charlie Brown Christmas, The Year Without A Santa Claus…He-Man & She-Ra: A Christmas Special. And I have possibly an even deeper affection for comic book holiday specials. The DC and Marvel collections from the 80s and 90s always hit a sweet spot for me as a kid, giving me just enough warm feelings with a healthy balance of action and adventure. Modern comics have brought us some incredible dissections of our biggest heroes and explorations of what makes them tick, but I don’t think anything quite cuts to the core of what it means to be a superhero like the season of giving and good will towards men. 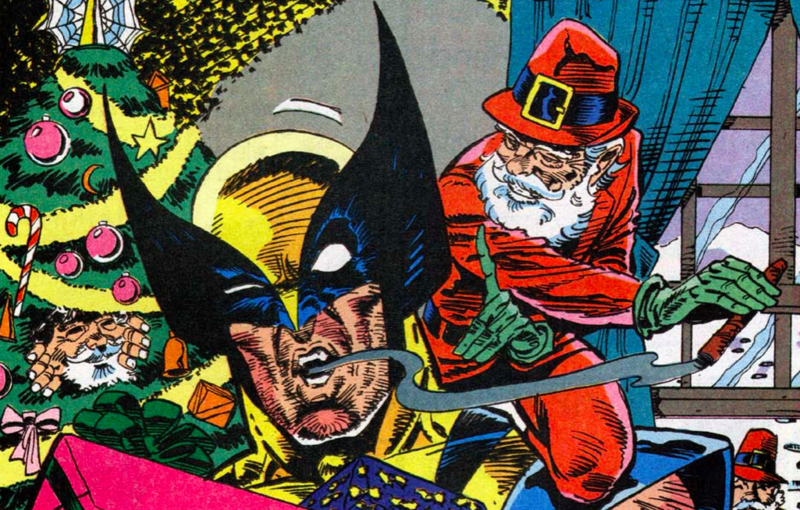 With that, I thought I’d kick off December with a look at my twelve favorite superhero holiday stories of all time. The Christmas setting doesn’t play too big of a role here after the first handful of pages (hence my ranking), but it’s always great to see the X-Men through Kitty Pryde’s eyes. We get to see how her teammates react to the season (surprise, Logan is still a grouch and Scott is still a sad boy) and Kitty gets in the spirit of things by planting one on Colossus under the mistletoe (best X-Couple; don’t @ me). The remainder of the issue that follows Kitty Pryde, alone in the X-Mansion, fighting for her life against an actual demon makes up not only one of my favorite Christmas comics, but one of my favorite standalone issues of all time. Kitty Pryde channels her inner Ellen Ripley, using her wits and her phasing power to outlast a creature that gave even Storm a run for her money. Paul Dini’s run on Detective Comics was an embarrassment of riches, especially when it came to one-and-done stories. Preferring to focus on the actual detection abilities of the Bat-Family, many of his stories from this time featured our heroes put in situations where they had to outthink their foes, rather than rely on brute strength to win the day. In this issue, Tim Drake is kidnapped by the Joker and forced to watch as the Ace of Knaves wreaks havoc on Gotham City. Joker’s festive garb and the yuletide setting are perfectly juxtaposed against the horrific crimes being committed, and the way Tim takes advantage of Joker’s perverted sense of “good will” to distract the villain is brilliantly handled. It’s an excellent display of Tim’s determination and ingenuity in the role of Robin and a chilling reminder that not even Christmas is sacred to the Clown Prince of Crime. It would have made a great (albeit unairable) episode of Batman: The Animated Series. The most recent entry on this list (just over a week old), this story finds the Last Boy on Earth hiding with a mother bear and her son after being nearly killed by the evil warlord of their snowy region. He tells them the story of the Festival of Lights that his grandfather celebrated, dismissing it as nothing more than an empty ritual. Over the course of the night, Kamandi learns the importance of his faith and allows it to reinvigorate his courage. It’s a short tale that explores this nearly 50-year-old character in a whole new way and already belongs on a list of the greats. Nick Fury feels his oldest at Christmastime. Having taken a serum to slow his aging, he’s a man who has outlived so many of his friends that it’s hard for him to want to celebrate. A message from the past makes its way to him and reminds him to live for today and cherish the friends he still has. This was one that confounded me when I read it as a kid, much preferring to read the stories featuring the fellas in tights over Nick’s mid-long-life crisis, but it resonates more and more with me as the years go by. Yes, the more obvious choice would be the much more holiday-centric “The Christmas Aliens,” but this issue is so good that I felt I had to include it instead. The layout of each page is brilliant, showing the progression of Leonardo’s losing battle against the Foot Clan along the top three-quarters of the page, then giving us a little respite in the bottom panels as we see April O’Neil and the other Turtles trimming the tree and getting ready for Christmas dinner. Until the final page, the Leonardo segments are completely dialogue-free, allowing the incredible snow-covered illustrations to tell the story and show us Leo’s desperation. The fairly recent color reprint is gorgeous, but do yourselves a favor and track down the original black-and-white artwork, which fully took advantage of the stark whites and shadows of the Christmas Eve setting. As in all of the best Hellboy short stories, exposition is largely thrown to the wind in favor of unexplainable magic and beautifully-drawn action. This one is a bleak story featuring Hellboy charging into the underworld to save a dying woman’s daughter from the demon who has stolen her. Mike Mignola uses the snow-driven backdrop to maximum effect, painting a Hellboy who could easily be mistaken for another jolly red man on a dark winter’s night. James Robinson’s Starman was a series ALL about legacy and living up to your family’s example. It’s fitting, then, that one of the best single issues of the series revolves around getting the family together for Christmas. Jack Knight stumbles upon a down-on-his-luck department store Santa and helps him out of a jam, eventually inviting the fellow over to spend the holidays with his friends and family. It’s a fun, warm issue that shows how the holidays can bring out both the best and darkest in all of us. Unlike the rest of my list, this one goes for full-on comedy. Much of the story involves the Avengers meeting for their annual Christmas party, which paves the way for their disparate personalities to create some hilarious situations. What kind of tree would Doctor Strange conjure up? What’s Iron Man planning with that mistletoe drone? Hang on, is that a robotic killer Santa? Beyond that, it allows the characters to engage in some very relatable holiday behaviors, like Spider-Man’s nervous attitude toward introducing his wife and aunt to his friends (and oh yeah, protecting them from an Ultron unit that thinks it’s St. Nick…we’ve all been there). It all culminates in Captain America doing what he does best and giving a speech celebrating everyone’s differences and the importance of the holidays. Boston Brand is understandably bitter. As the superheroic ghost known as Deadman, he can only really experience the holidays by possessing others. He begins to feel selfish for taking someone else’s Christmas and rages at the goddess who made him into what he is. At that moment, a visitor from DC Comics’ previous timeline visits him to remind him of why he chooses to be a hero, even when it’s not the easiest road. This entry is as much a beautiful Christmas story as it is a love letter to the great creators of DC’s past, which is why it has stuck with me since the first time I read it as a wee lad and why it’s so important for any DC fan to check out. This one is about as unabashedly saccharine as it gets, which makes it work all the more. Batman is convinced by Commissioner Gordon to spend Christmas Eve singing carols with the GCPD gang. Batman agrees to play along until they hear their first report of trouble…which never comes, thanks to the people of Gotham being reminded in various ways to follow the Caped Crusader’s example. If that doesn’t make you believe in the spirit of the season, what will? Recently reprinted in the Walmart-exclusive World’s Greatest Super Heroes! Holiday Special (go get it, RIGHT NOW), this is everything you could want from a Superman story, let alone a Christmas story. The Man of Steel spends the end of his year going through the thousands of letters he receives from people all over the world. The sad truth is, he can’t save them all. What makes him Superman, though, is that he does his very best. This story explores the depths of Superman’s humanity and Lois Lane’s love and admiration of him in a poignant way that will melt even the coldest anti-Superman comic reader’s heart. This collection of year-end stories achieves that elusive goal that all anthologies reach for, in that every single segment is a winner. All but one of the stories in this special were adapted for television in The New Batman Adventures episode “Holiday Knights.” It’s a thrill to see how the colorful cast members of TBNA react to the holidays; even perpetual buzzkill Harvey Bullock has a moment of true good will. The one segment left out of the television adaptation, “White Christmas,” may be the finest Mr. Freeze story ever written, managing to squeeze an origin story, a high speed chase, a fierce fight in a graveyard, and a heartbreaking final monologue from our villain into just thirteen pages. If that doesn’t get you all choked up, the issue’s coda will, as Batman and Jim Gordon celebrate surviving another year over a cup of coffee. It’s a quiet and beautiful moment that shows a complete understanding of the two characters and also illustrates the importance of friends and fellowship in the darkest of times…and isn’t that what the holidays are all about? Well, that does it for my list! Do you have a favorite superhero holiday yarn? Which ones did I miss? Sound off in the comments! I’m always looking for more crimefighting warm fuzzies.